Click for information on Buhl , Bliss , Stanley , Hagerman Fish Hatchery , 1000 Springs , Balanced Rock , Sawthooth National Forest , Idaho Info and more Idaho Info . 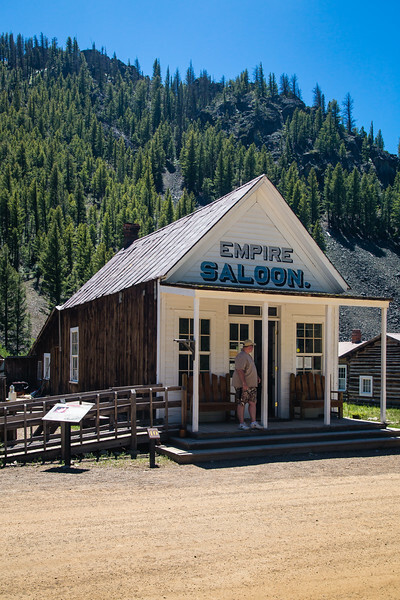 Custer, ID - Empire Saloon - After a hard day of work, many townspeople sought rest, refreshment and entertainment. There was no shortage of drinking establishments in Custer and at times no shortage of customers. At least five saloons were in operation at one time. The Empire Saloon was originally near the Custer Mine but was later moved to this location and converted into a home. For a period of time Dr. Charles Kirtley maintained his office and drugstore in the front area while his family lived in the back two rooms.